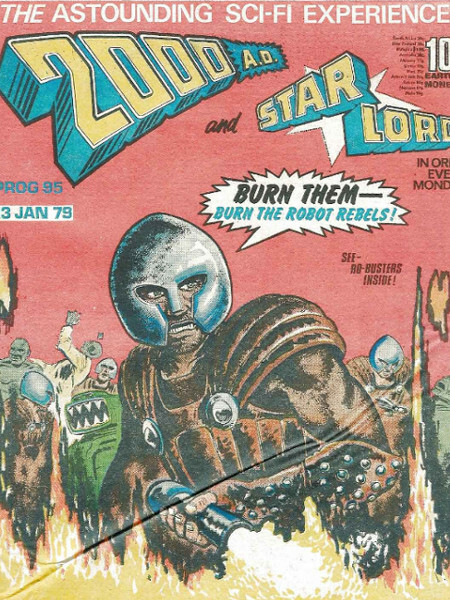 This is an ongoing series of blog posts where I am reading comic books from the far distant past, specifically early 1979. 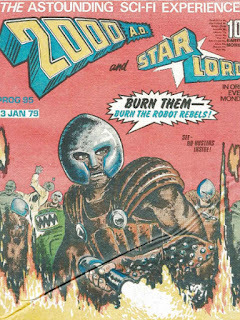 This time I am looking at issue 95 of 2000 AD. It came out 13 Jan 1979, and sold for the princely sum of ten pence. The cover of issue 95 is extremely lacking in detail, and what detail there is, in the costume of the character on the cover, makes him look he is dressed to appear on an episode of Blake’s 7. The costume department on that show were very fond of leather and studs, and season two had started to be broadcast around this time. 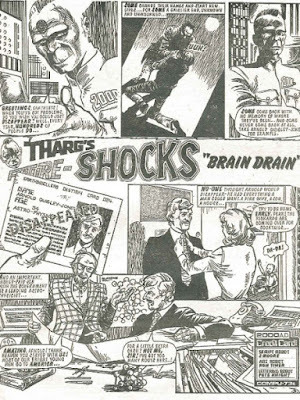 Judge Dredd and Ro-Busters are the two star strips of the comic book, and so they are presented first and second, respectively, but I want to skip ahead to a later strip, the fourth in the comic book, that appears in the Tharg’s Future-Shock slot. I usually don’t spend much time talking about the Tharg’s Future-Shocks strip in any particular issue of 2000 AD, but I’m going to make an exception for the one in issue 95, and that’s because, as a nine year old, reading the comic for the first time back in 1979, it scared the living s**t out of me. 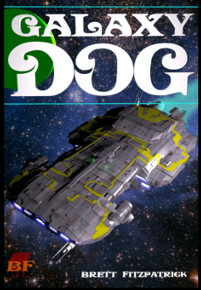 The story is by S. Moore, while the art us by Ron Tiner. The Future-Shock has quite a hokey format, including an intro by an omnipotent narrator, like the Twilight Zone, except here the narrator is an alien called Tharg. 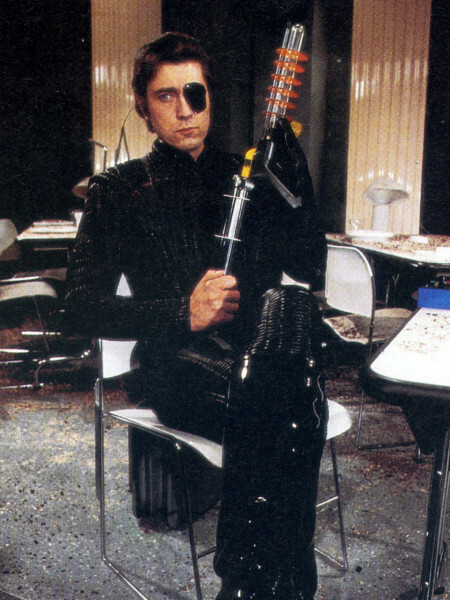 He is the powerful alien who has been editing 2000 AD since it started. The story offers to tell us about one of the many people who simply disappear without a trace, a man named, Arnold Quigley-Jones. For people lucky enough not to be acquainted with the status signifiers within the English class system, this character’s hyphenated, double-barreled surname marks him as a member of the upper middle class. We can assume he is living a comfortable life of success and status. This is confirmed in the next panel where we see Arnold’s boss, a pretty stereotypical scientist. There is a text box that tells us Arnold is a leading government astrophysicist. The boss thanks Arnold for not being part of the Brain Drain that everyone was terrified of in the UK, back in 1979. Everyone thought that the UK’s top intellectuals were exiting the country and going to the USA, leaving the UK lacking in scientific research skills and unable to compete on the world stage. We then see Arnold’s idyllic life as part of the 1970s patriarchy, with a big house, subservient wife, and offspring to carry on his hyphenate name. 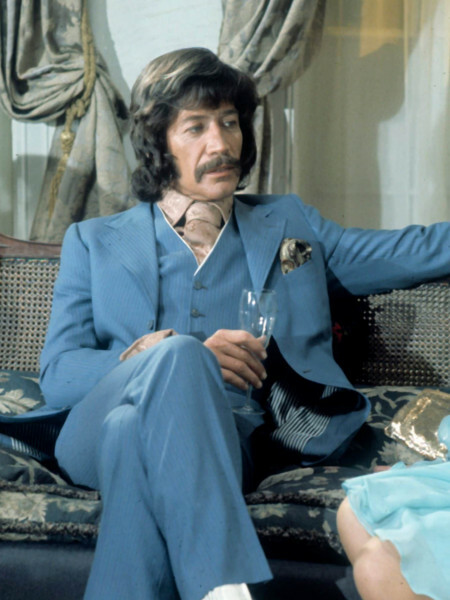 In the scenes of domestic bliss, Arnold has bouffant 70s hair, a pencil thin mustache and a sharp suit with wide lapels, the markers of a dandy. Arnold decides to take the dog for a walk, and promptly gets himself abducted by aliens. Like any normal nine year old, I sometimes thought about what it would be like to be abducted by aliens, imagining it would be like becoming one of the Doctor’s assistants in Doctor Who, so I started to read more attentively. The alien’s spaceship wasn’t as cool-looking as I would have liked, but I decided it did look alien, and it did have character. I’m pretty sure it is copied from the background of a drawing by Ezquerra. It has his organic look to it, which means Ron Tiner, if he can’t draw spaceships, is probably not a good fit for 2000 AD. And, in fact, I don’t remember seeing much of his work within its covers. I was quite enjoying seeing Arnold given the choice by the aliens to join them, as part of their advanced society. But then comes the obligatory twist ending, the shock in the Future-Shock. 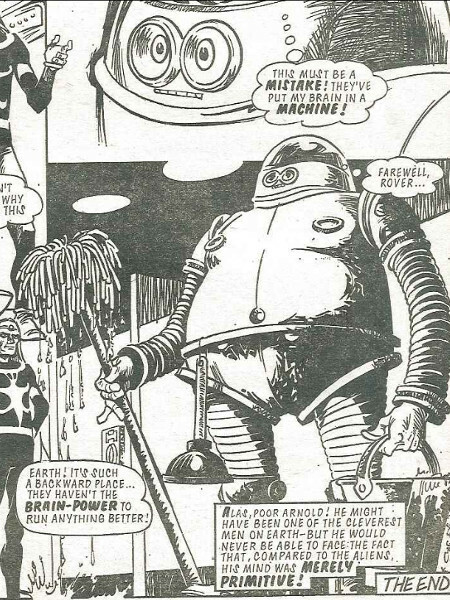 It turns out that an Earth genius is only good enough to mop floors on the alien space craft. They scoop out Arnold’s brain and put it in a robot with no voice box, so he can be their cleaner without them being bothered by any of the primitive stuff he might have to say. He mentally says farewell to the creature he will miss most, his dog Rover, without a second thought for his wife or child. It was a big shock to me, forced to consider the possibility that alien abductors might force me into a life of cleaning and household chores as a brain in an alien robot. To a nine year old, there is no worse fate than being made to tidy up and clean for all eternity. That image of Arnold, no longer a dandy, now a janitor droid with a mop has stayed with me, and I can still remember every pen stroke of that final drawing of Arnold in his new body. The idea still gives me the shivers. After the future-shock cones a new story to 2000 AD. It starts with a pilot in a pretty cool jet. 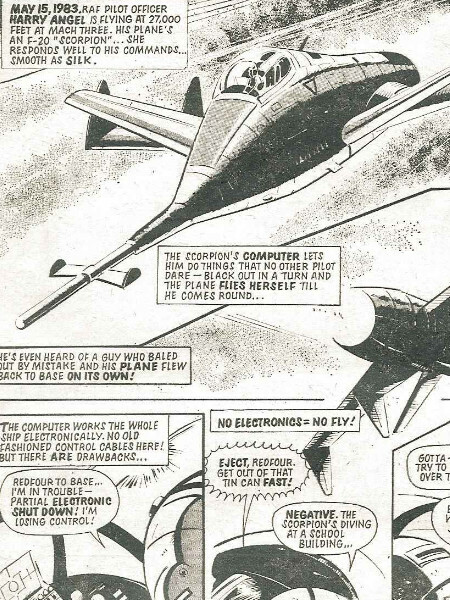 It’s a very near future story, with cutting-edge technology technology for the time, such as fly-by-wire and the plane being able to land itself. But then the electronics fail and, a the strip says, No Electronics = No Fly. There’s a crash and the pilot wakes up in hospital. The story is called Angel and it has lovely, old school art by Pino. 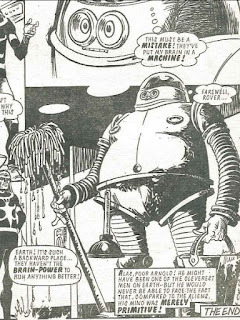 It looks like it is going to be a great addition to 2000 AD’s roster of stories, but then things get silly. It is explained that in the crash the jet’s computer was melted into the outer layers of the hero’s skin, from where it has connected to his nerve endings. For some reason this means he can now fix medical computers with his bare hands. This makes “sort of” sense, but then it turns out the computer in his arm thinks he’s a jet and this gives him superpowers. It’s a very, very dumb origin story, like the Six Million Dollar Man, but it happens by accident. 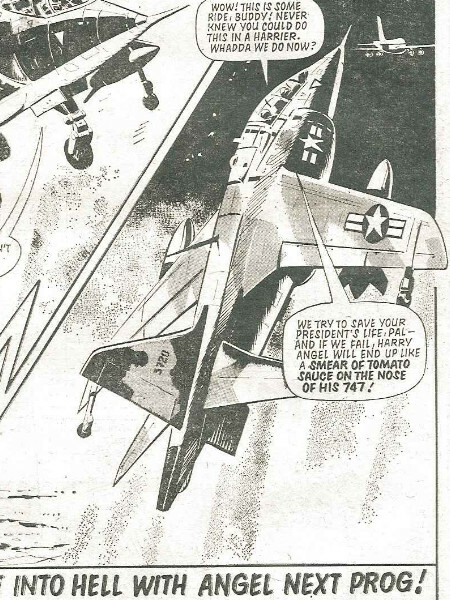 Anyhow, the strip does finish with a nice drawing of a Harrier Jump jet, for which I can forgive it a lot. 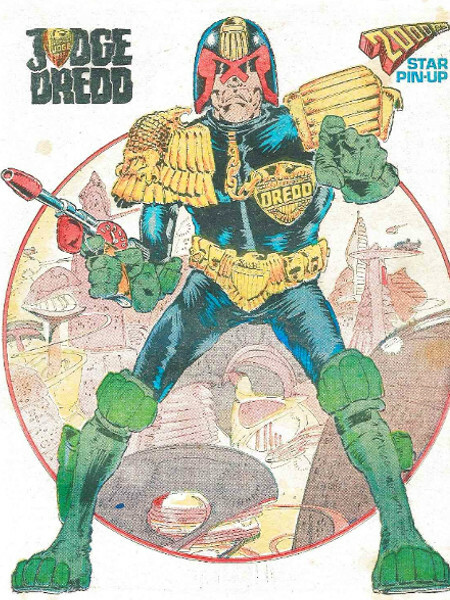 On the back of this issue there is a classic depiction of Judge Dredd, done by Mike McMahon. The shading on his pleather jumpsuit us great, and the exaggeration of eagle and stripes shoulder pads is also wonderful. I spent many a long evening trying to copy this image, in the sane way that Victorian painters learned their trade by copying the works left by the masters of antiquity. It’s a small detail, but the lightning strikes in his helmet visor are particularly well drawn, and difficult to copy. The city imagined behind Dredd still looks futuristic now, specially as we are finally starting to be able to build such huge curves on such a monumental scale with our technology today. This issue was a fun read for me, and it brought back a lot of memories. I didn’t talk much about Judge Dredd or Ro-Busters this post, but rest assure I will be casting my eye over them again in future posts.